to use something close to what we discussed so far. Interesting. That is certainly one way to make it work – and likely less hacky than all the other ways I was looking at doing it. It will makes the user write rst, but it makes a nice bridge between the two. Luckily the number of directives with a body is small so would be possible to use the markdown parser for it but keep the option parsing. One of the items that should be checked twice is the cross-reference support. Wild idea. How about unifying code for plugins and code formatting. The average user cannot tell the difference anyway, so why bother. Here is a video of my cat. The markup looks leaner and intuitive, I wonder how it would behave with other formatting needs (e.g. sphinx/docutils bridging). average user cannot tell the difference anyway, so why bother. them to links or whatnot. One nice thing about most lightweight markup languages is that they do not rely on English words for tag and attribute names or keyword values since they are repurposing ASCII punctuation/non-alphanumeric characters instead. All those extensions with key-value pairs and explicit names harm that principle. They are a step back. They are not based upon prior art, i.e. actual practice in plain-text media. They are not in the spirit of Markdown. They impose coder habits onto a general purpose language. They must be considered harmful. They are a bad idea. That being said, there is a place for names that are not predefined, i.e. IDs and classes, or that are proper names, e.g. language names for automatic highlighting in code blocks. IDs can be auto-generated, however, in most if not all cases. In other words, if you want verbose tags you have come to the wrong place and should use XML/HTML or (La)TeX instead. 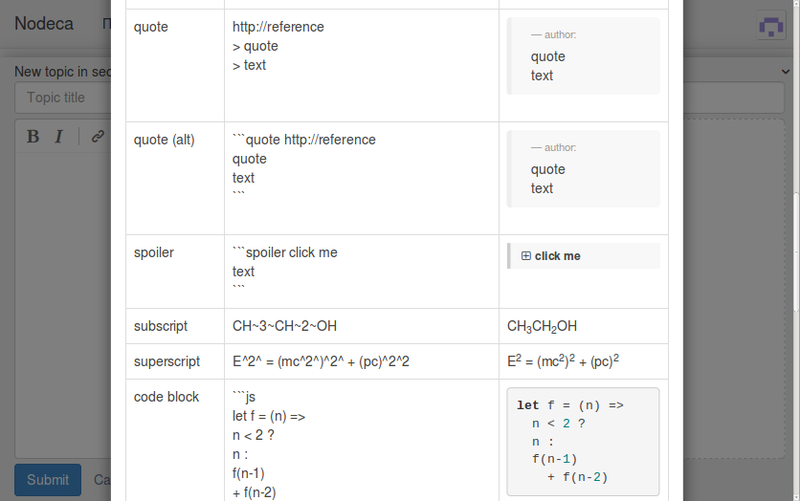 This is a real advantage of Markdown (and its ilk) over LaTeX, DocBook, HTML, etc. If you write in Swedish, your source document looks like Swedish – not Swedish with a bunch of English words mixed in. So I’m against hard-coding English words into the syntax. Of course, going too far in the other direction makes your source document look like Perl. Just discovered and played around with @vitaly’s markdown-it container plugin which allows the most basic form of 3. Container Block Directives proposed above. Pretty cool! Looking forward to hear your experiences when you’ve got more user feedback etc. Don’t be confused wit ``` syntax. That’s for convenience. It overrides defaults when keywords quote and spoiler used, and run our plugin to allow markup in internal content. Yup mb21, I would be interested to see how the custom container function in the wild. Seems to be fine so far. Unfortunately, the details element is not widely supported by browsers. then at least as a ‘detail’ block within commonmark, but expressed in html in whatever best way we can do for now (e.g. how we do spoiler text in html nowadays). There is no need for using a <detail> element which is already kind-of-defined in HTML, but may or may not be recognized by browsers and other HTML consumers: if the purpose (from the point of view of the CommonMark processor) is to “wrap” an uninterpreted block of raw text (which is what I take from @mofosyne’s remark about “to see how the custom container function in the wild”), one better “invents” an element type name which does not conflict with popular DTDs like HTML. This works already quite nicely for an element type called <mark-up> in my little project (not exactly “in the wild”, but we’ll go there): As the CommonMark processor cmark_filter does now, so will other mark-up processors recognize and process this special “container element” type only, until it is vanished from the output document. That’s an interesting key word you mentioned there: “recommonmark”—so thank you for the hint! Exactly and probably this part should be agreed soon, since would be nice to be able to use it. On the other side, I wouldn’t see any harm in allowing either colons : or equality signs = when specifying attributes, or allowing optional commas ,. The values on the right-hand side of a key-value pair shouldn’t contain either symbol and the additional overhead for parsers is minimal. Markdown has some relations with HTML (e. g. it allows HTML code), so HTML attribute syntax is preferable. It seems like this discussion has significantly stalled; is that right? I’m trying to research what the current state of extending Markdown is, and this thread seemed like the place. Is that true?